As part of our whitebait conservation work Resilient Shorelines developed a methodology for using artificial habitats as an experimental tool. The objective was to overcome detection problems that are inherent in other techniques. This approach provided valuable information to support other investigations designed to location and map spawning habitat. The main results have been published in Ecological Indicators. The identification of spawning sites is a significant issue for management. It is usually attempted by direct observations of adult fish during spawning events, or searches of riparian vegetation for eggs. However, both of these approaches have conceptual and practical weaknesses. As an indicator of spawning habitat, observations of adult fish suffer from poor precision unless spawning was actually observed. Adult īnanga spend several days shoaling in pre-spawning aggregations and devote considerable energy to searching riparian vegetation prior to selecting a spawning site (Benzie, 1968). There may be a large general location in which the same aggregation could be observed prior to spawning that is relatively imprecise compared to the habitat actually used. In comparison direct searches for eggs provide indisputable evidence that spawning has occurred. However, egg mortality between the date of spawning and the field survey may reduce the effectiveness of this approach. Recent research has found that spawning may occur irrespective of whether the habitat is favourable for egg survival (Hickford & Schiel, 2011). The novel use of artificial habitats as a detection tool takes advantage of previous research showing that the artificial habitats support very high egg survival rates (Hickford & Schiel, 2013). This reduces the effect of egg mortality on discoverability of spawning sites that is particularly likely at degraded sites. This may result in undetected spawning sites and/or under-estimation of the areas they originally occupied. In a practical sense it also means that timing is less critical for field survey logistics. For example, it can assist a small team in surveying a large study area whilst also addressing the confounding factor of egg mortality which can result in uneven detection probability over time across the study area. In other words, areas surveyed first have a greater chance that eggs would be discovered compared to those surveyed after several days have elapsed. Using the Christchurch post-earthquake studies as an example, this effect can be considerable. These studies required 8-9 days of survey effort by a team of 3 researchers to cover the study site area (Orchard & Hickford, 2016). Figure 1. Straw bales used as an artificial spawning habitat for īnanga. Each installation is secured by a loop of wire attached to steel stakes which are driven down to pin bales to the ground. The long axis of the bales is oriented perpendicular to the riverbank. Adapted from Hickford & Schiel (2013). 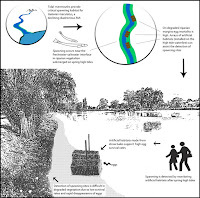 Following this method, artificial habitats are used in conjunction with census-style surveys of riparian vegetation with the objective of detecting and quantifying all of the spawning sites in the study area (Orchard & Hickford, 2018). The distribution of naturally occurring spawning sites was obtained from the results of the egg surveys. In addition, we applied a habitat quality assessment to the entire study area and used this to define and identify ‘degraded’ areas. The experimental design for placement of artificial habitats sampled these degraded areas. The artificial habitats were deployed in three situations of interest: degraded areas within the distribution of naturally occurring spawning sites (i.e. degraded gaps), and degraded areas both upstream and downstream of the known spawning limits. Over two years of trials this approach was successful in identifying spawning at degraded sites in all three situations of interest (as above). Spawning was often detected in the degraded gaps, indicating that these areas could be readily restored if desired. Spawning was also identified on artificial habitats beyond the upstream or downstream limit of naturally occurring spawning sites, with examples of both found in our studies. This indicates that the potential spawning reach could be a longer stretch of river than identified using egg surveys alone. For the design of management tools such as protected areas this is important information. Decisions on protected area boundaries typically occur infrequently and it is important that all of the areas that are potentially being utilised by īnanga are identified despite that there will always be some uncertainty due to detectability challenges. All of the areas that were identified through the use of artificial habitats are certainly locations that could be used again for spawning, especially if they were restored. Artificial habitats were successfully applied as a detection tool in the Resilient Shorelines project. The technique assists conservation planning by helping to address the current lack of information on spawning locations. Our findings extend the literature on the use of artificial habitats to identify habitat and occupancy patterns characterised by detection challenges. Other examples we are aware of include the monitoring of insects, and lizard species. In the future a similar approach could be useful identity spawning habitat in other catchments and to help monitor spawning activity over time, especially in degraded riparian environments. Benzie, V. (1968). Some ecological aspects of the spawning behaviour and early development of the common whitebait Galaxias maculatus attenuatus (Jenyns). Proceedings of the New Zealand Ecological Society, 15, 31-39. Orchard, S., & Hickford, M. (2016). Spatial effects of the Canterbury earthquakes on īnanga spawning habitat and implications for waterways management. Report prepared for IPENZ Rivers Group and Ngāi Tahu Research Centre. Waterways Centre for Freshwater Management and Marine Ecology Research Group. Christchurch: University of Canterbury. 37pp. Available here.